Your PetSafe® Microchip Cat Flap has been designed to allow your cat easy access to the outside world whilst keeping other troublesome cats and animals out of your house. The PetSafe® Microchip Cat Flap works by reading your cat’s unique microchip ID without the need for a collar or accessory. Please note - the read range on this unit is 10cm - 12cm - measured from outside of flap (the material the cat flap is fitted into may reduce this e.g. metal). Also if the door panel is reinforced with metal the range of the chip scanner will be affected, to resolve this you can fit the flap using the Petsafe glass/wall adaptor. Please note for metal doors, doors reinforced with metal or reinforced panels with a foil sheet on the plywood reinforcement, you will need to cut a 260mm diameter hole and use the Petsafe Glass adaptor (PAC54-16246) OR you can buy a replacement door panel , available in 20mm, 24mm & 28mm, from our website. Our replacement panels do not have any metal in them. *It is not possible to cut holes in toughened glass or double glazed units except at the time of manufacture. Please contact a glazier. Give your cat indoor or outdoor freedom with added protective features including a 4-way security lock and a weather-resistant magnetic flap. 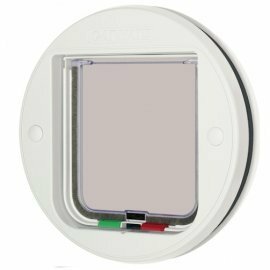 This energy-efficient cat flap is easy to install with its universal fitting for walls and doors. Please note if you need more than one tunnel order the 919 and extra tunnel extensions the tunnel on this model is not extendable. The 4-Way Locking Cat Door allows you to control your cat’s access in and out of your home. The 4-Way lock allows you to choose from four access options: open, locked, in-only and out-only. The open option allows entry or exit, the locked option does not allow entry or exit, the in-only option allows entry but no exit and the out-only option allows exit but no entry. The 4-Way Locking Cat Door can be installed in interior or exterior doors or walls. An optional tunnel is included for installation in doors and walls 2" thick. Additional tunnels are available (sold separately) for installation in doors and walls thicker than 2". Suitable in glass double glazed units, upvc panels, wooden doors and brick walls with optional tunnels. Suitable for doors up to 50mm (2") thick. Specially developed for the largest cats or small dogs such as Yorkshire Terriers, Pekinese, Dachshund, Minature Poodles and Spaniels up to a shoulder height of 360mm (14"). The attractive circular design styling of this 4-Way locking flap makes this a stylish alternative for fitting to all doors up to 50mm (2") thick. It is particulary recommended for single / double / triple glazing.